Highlighted Archive If a Picture is Worth 1000 Words then why doesn't everyone have Full day Kindergarten? This presentation is the result of a program evaluation of an Extended Day Kindergarten Program. Data were collected from a large geographically diverse district with students representing urban, suburban and rural populations. Longitudinal data have shown that some students were at great risk for academic failure. Students selected for Extended Day were primarily from low socio-economic, ethnically diverse families. historically the school has been able to identify these students from day 1, and although staff have worked hard, little has worked, Until Now. This presentation summarizes the effects of a kindergarten intervention implemented in two different districts, with first grade follow-up. A Presentation given at NASP 2011 in San Francisco. Full Slides for Advanced Data-Based, Decision-Making. 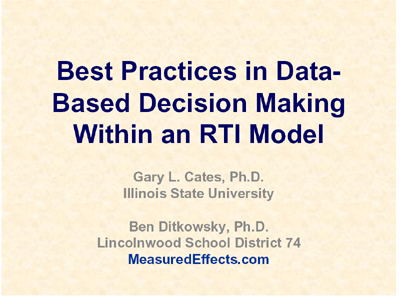 This presentation covers Seven big ideas in Data-based Decision-making in schools including, RTI, Grouping Students for Intervention, Problem Solving, Goal Setting, Progress Monitoring, Resource Allocation and Program Evaluation. Increasing demands associated with accountability for learning have led many schools and districts to move away from commercially published and scored standardized norm – reference tests to standardized measures of general outcomes that can be administered and scored in the confines of a teacher’s classroom. Although many practitioners of the traditional assessment ilk, have begun to struggle with the popularity of these quick, efficient measures of general outcomes, and in many districts a Kuhnian battle of sorts (1962, p. 84) has been the result. This document is the result of many questions that have been asked about the technical adequacy of R-CBM and MAZE as predictors of High-Stakes State Tests in Illinois. 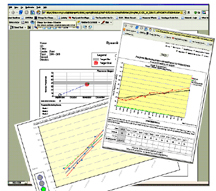 These are the workshop slides that were presented at NASP in March 2010. This paper reports the results of an analysis of the relation between CBM and DIBELS data and the Illinois Standards Achievement test results for more than two thousand students from cohorts of third grade students between the 2003-04 and 2006-07 school years, for all or some schools in six different districts. School and District staff looking to see how many students need to meet standards in order to "get over the bar" -Here is the file. The application of the 95% confidence interval with respects to the NCLB ladder - These tables include the number of students required to meet or exceed standards in order to minimally make AYP with the application of the 95% confidence interval. Note. The number of students included is rounded forward. These presentation slides cover uses of Curriculum – Based Measurement (CBM) from multiple perspectives. 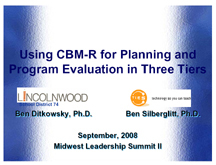 Topics covered include (1) using CBM data can be used for planning and resource allocation; (2) predicting high-stakes outcomes and how cut scores for CBM are derived; (3) how CBM data can be used to evaluate progress, and programs. 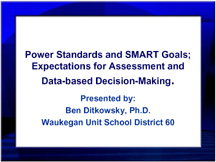 A sample presentation that spans grades K - 11, with a spotlight on goal setting with data.